In the late 19th and early 20th centuries, the use of bicycles by police forces in Europe and North America was common. The 2 wheeled vehicles were largely abandoned with the invention of the combustion engine, as cars and motorcycles replaced the bicycle as a means of patrolling a beat. In 1987, the Seattle Police Department re-introduced bicycle patrols and reported unprecedented success, both with community relations and as a crime fighting tool. Over the next few years, the use of Police mountain bikes spread across North American cities like wildfire. 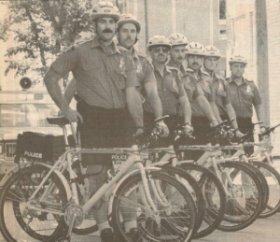 Recognizing the potential of modern bicycle patrol, the Saskatoon Police Service joined the trend fairly quickly in 1992 by deploying 7 officers on bicycles to patrol the downtown area. Over the years, the unit and the equipment used have evolved. Today the "Bike Unit" is made up of 16 Constables and 2 Sergeants. Each of the 4 platoons has a team of Bike Unit members who work both day and nightshifts. Each officer is required to undergo fitness testing and an interview process prior to joining the unit. 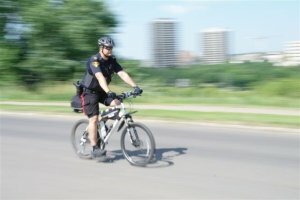 Cycling days are demanding, officers will pedal an average of 50 km per shift. Bicycle mounted officers respond to the same types of calls as their motorized counterparts. They have the advantage of arriving at the scene of an incident undetected, and are often able to catch criminal occurrences in progress. In addition to this, they are expected to patrol areas that are inaccessible to cars. The Bike Unit is also an invaluable tool in keeping crowds safe at special events and during demonstrations or other similar events. Bike Unit members are also in high demand at community events and frequently speak to young people about bicycle and personal safety. Bicycle officers are seen by members of the public as being very approachable, and as such are able to easily build ties with the community. Each Bike Unit member is outfitted with a mountain bike meeting his or her specific size requirements in addition to being supplied with performance riding uniforms. 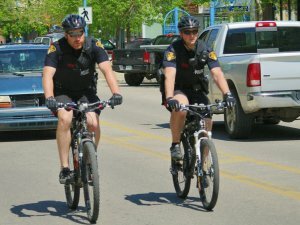 Every police officer in Saskatoon who rides a mountain bike must undergo specific police mountain bike training sanctioned by the Law Enforcement Bicycle Association. The most proficient riders are singled out to receive certification as instructors. Bike Unit members have recently started to receive training in crowd management techniques. Police bicycles are deployed to most events were large numbers of people congregate, and are able to effectively maintain order. Parades, Canada Day and the Ex are a few examples of these events. Over the last few years, the Bike Unit has also proven its worth during the George W. Bush visit protests and several marches on city streets. The cycling season is entirely dependent on weather. Most years however, the Bike Unit is able to use bicycles from mid-April to late October. In the winter months, Bike Unit members spend most of their time pa-trolling the downtown core, Broadway and Riversdale districts on foot. They are also used to supplement patrol officers during peak times. 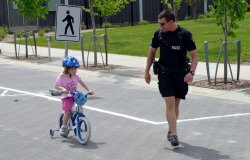 Saskatoon Police Officers who join the Bike Unit are very positive about their work. Former bicycle patrol officers report that their time on mountain bikes was the most enjoyable part of their policing careers. The health benefits, environmental and community policing implications of bicycle patrols are undeniable. What some in the early days considered a public relations gimmick has proven itself to be an invaluable, versatile and intrinsic part of modern policing.